For those who like the beach, of course it’s a pity not to go to Bali. An island which is famous for its tropical temperature, is the champion of beach tourism. Bali is a paradise for surfers. Surfing is the most loved water sport activity in Bali. Many domestic and foreign tourists are willing to come to Bali just to feel the waves and the sensation of surfing on the island. For the beginners, Kuta beach can be the exact choice. The waves are not too big plus there are many surfing schools and surf board rentals in this place. It will be different if you are used to big waves, Uluwatu and Canggu deserved to be the choice. Uluwatu mostly used as the location of international surfing competitions because the wave height can reach 8 meters. Whereas Canggu has the most enchanting black sand charm, and is known for its consistent and long waves. If you are afraid to deal with waves directly, scuba diving can be a perfect alternative. There are several dive sites in Bali which are famous for underwater scenery, namely Menjangan Island, Sanur, Amed Karangasem, Amuk Bay, Tanjung Benoa Beach and Tulamben. Tanjung Benoa Beach is more crowded with tourists, because in addition to being close to the airport, it is also located in the South Bali recreation center. To do this activity, you don’t have to be a great swimmer. You will be given a complete diving equipment, such as oxygen tubes, wet suits, masks, and many more. 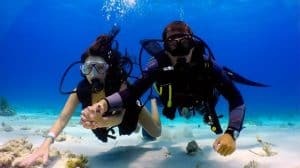 Before diving, you will be taught on how to dive, as well as breathing techniques. One experienced instructor will accompany you under the ocean. 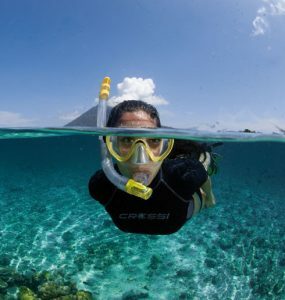 Snorkeling is a swimming activity while looking at underwater scenery. The difference with scuba diving, is that the participants do not dive. You float on the surface using diving gogges, which are equipped with a snorkel or breathing aid mouthpiece. Previously you will be given directions about the rules of the game, especially how to regulate the breath, because you will breathe through the mouth. This is one of the most popular and unique water sports because it combines the concept of skateboarding and surfing. Generally wake boarders often do this activity at sea. They stood on a wake board board, held a rope and pulled a speed boat with an average speed of 25 km / hour. However, if you are still a beginner, come to Bali Wake Park which is located on Benoa No 7X Harbor Road, Pesanggaran, Benoa, Denpasar. This is a water sports arena that offers wake boarding activities on an artificial five-hectare lake. 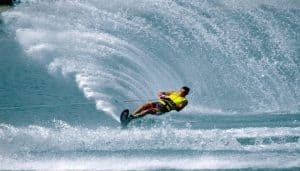 Bali Wake Park is the first water sports arena in Bali that uses a cable system, where wake boarding can be done at any time without regard to weather or wave conditions. This sport can be played from the age of 6 to 70 years. This activity can be done at Sanur Beach or Tanjung Benoa Beach, approximately 30 kilometers from the Airport. To do sea walking, you don’t have to be able to swim or have diving skills. You will be given a special helmet that has been equipped with clear glass, and has been supplied with pure oxygen. Before the boat takes you to the middle of the sea, the instructors will give a little guidance on how to dive, breathing techniques, as well as things that must be considered on the sea floor. After that you will go down the stairs to a depth of 5-7 meters. For 30 minutes on the sea floor, you are free to walk, feed fish, and even take pictures with coral reefs. 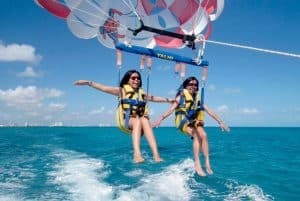 Like birds flying in the air, parasailing activity is certainly a must to try. Parasailing is a water sports activity where you will use parachute umbrellas and be pulled by a speed boat around Tanjung Benoa Beach. The length of a parachute rope with a speed boat is around 80 meters, which makes you feel the sensation of a paratrooper. Before trying parasailing games, tourists will be given direction by the guide, starting from the introduction of the tool, standing position before flying, and of course the technique before landing. Parachute umbrellas used will be adjusted to the size of the passenger weight, with the color of the umbrella that can be chosen by yourself. All equipment provided meets international standards and guides will be happy to accompany while flying in the air if you have not dared to fly by yourself. The sensation of riding a motor cross in the ocean would be very exciting. For this reason you must try jet skiing in Tanjung Benoa. This is the activity of driving a motorized vehicle in the water, just like riding a motorcycle on the highway. Before the activity of riding a jet ski begins, the guide will give directions on the engine, gas, brakes, and driving techniques on the water. 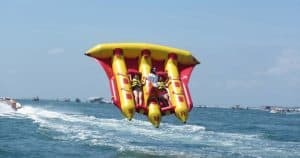 Because of the many water sports activities in Tanjung Benoa, you will be accompanied by a guide to the middle of the sea to avoid collisions with other sea traffic users. Arriving in the middle, you can try it yourself with the condition that it is prohibited to drive jet ski at high speed. Flying fish is still the most recent game in Bali. This is a water play activity using an inflatable boat that looks like a flying fish. So three banana boats were made together with the addition of a rubber boat across the front, and there was a kind of wing to the right and left. Flying fish is played by a maximum of three people, namely 2 passengers on the right and left, and one instructor in the middle. The guide will give direction about the right position on the boat, which can stand like riding a motorcycle or sleeping on your back. Furthermore, the flying fish will be pulled by a high-speed speed boat with a path against the wind so that it will fly up to two meters above the water depending on wind speed. It must be exciting. Another marine tourism for you who is adventurous is water skiing. Although Bali does not have snowy mountains, you can still ski, that is by stepping on a board and pulled by a speed boat. The rules of the game are easy. You will stand on the board and wear shoes attached to the board. While holding a rope about 3 meters long, which is tied to the speed boat section, you will be drawn around Tanjung Benoa Beach. This game will last for 15 minutes for one round, which usually takes place from 8 am to 12 noon. Do you want to be able to fly up into the air like Iron Man? If so, of course this one activity is worth trying. Fly boarding is one of the most extreme and challenging water sports. 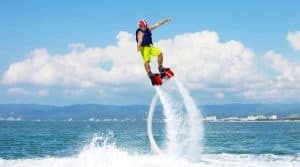 You will be provided with a special board such as a wake board with a pair of shoes that have been attached, then you will be driven by high pressure water so you will fly over the surface of the water like a superhero. This extreme game is one of the most challenging new attractions in Tanjung Benoa, and not all providers have it. So if you want to enjoy the sensation of hovering up to 10 meters above the water surface, it’s a good idea to order early. Trained instructors will provide guidance on adjusting the use of tools and controls that are actually quite easy so anyone can try. This sensation of flying over the water will last for 15 minutes. If we visit Tanjung Benoa Bali attractions, we will be introduced to the rolling donuts game. However, don’t imagine the game of making donuts or eating donuts, because rolling donuts is one of the new water recreation games. To enjoy this game, you are required to ride a rubber boat that looks like a donuts. Next you will be pulled by a speed boat to circle the beach, with a distance between the speed boat and donuts boat around 5 meters. The number of passengers on the right and left sides must be balanced, between two or four people. This game will last for 15 minutes for one round. Read also fun activities in Bali. What water sports activities are most often played in Tanjung Benoa? The answer must be banana boat. This is a water recreation game, using a rubber boat shaped like a banana and it is large. 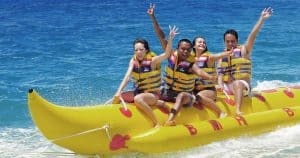 Banana boats can be boarded by four passengers and one guide. Like riding a horse, the boat will be pulled by a speed boat to spin around Tanjung Benoa Beach for 15 minutes. You can also ask for additional attractions on the guide to turn the boat over.